[W]e, the undersigned, respectfully petition: first, that you exercise your power as Commander-in-Chief, to rule that the United States shall not resort to the use of atomic bombs in this war unless the terms which will be imposed upon Japan have been made public in detail and Japan knowing these terms has refused to surrender; second, that in such an event the question whether or not to use atomic bombs be decided by you in the light of the considerations presented in this petition as well as all the other moral responsibilities which are involved. In the spring of 1945, Szilard took the petition to the man who was soon to be named Secretary of State, James F. Byrnes, hoping to find someone who would pass on to President Truman the message from scientists that the bomb should not be used on a civilian population in Japan, and that after the war it should be put under international control in order to avoid a post-war arms race. Byrnes was not sympathetic to the idea at all. Szilard regretted that such a man was so influential in politics, and he appeared to also be despondent at having become a physicist, because in his career he had contributed to the creation of the bomb. After the meeting with Byrnes, he is quoted as having said, "How much better off the world might be had I been born in America and become influential in American politics, and had Byrnes been born in Hungary and studied physics." In reaction to the petition, General Leslie Groves, the director of the Manhattan Project, sought evidence of unlawful behavior against Szilard. Most of the signers lost their jobs in weapons work. ^ a b "A Petition to the President of the United States". 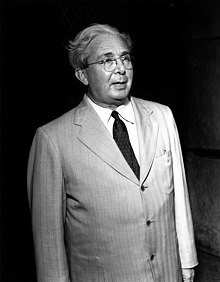 Atomic Bomb: Decision, section of Leo Szilard Online. ^ Goodman, Roger (director) (1995). Hiroshima: Why the Bomb Was Dropped. ABC News. 00:28:00~00:31:00. ^ "Groves Seeks Evidence Against Szilard, July 4, 1945". Atomic Bomb: Decision, section of Leo Szilard Online. Howard Gest, "The July 1945 Szilard Petition on the Atomic Bomb: Memoir by a signer in Oak Ridge"
This page was last edited on 10 January 2019, at 22:21 (UTC).